Batch is bold and beautiful swish style premium portfolio WordPress theme has 5 page templates and supports 4 post formats. Batch is 100% responsive layout, retina display ready portfolio theme enabled with off canvas mobile navigation. So, mobile users get unique navigation. 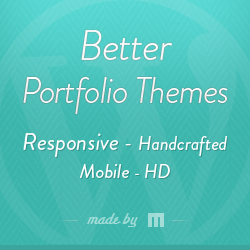 Batch portfolio theme has 2 home page layouts and it supports static background image as well. Batch portfolio theme coded with valid HTML5 / CSS3 standards and it has 3 portfolio templates which support videos from YouTube, vimeo and self hosted videos. Available with 4 custom widgets, PSD files and supports multilingual website by editing .MO and .PO files.